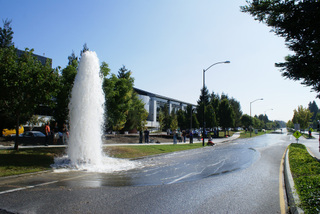 Earlier this week a water pipe failed under a fire hydrant on Charleston Road in Mountain View, California, home to Mr. O'Legog's Search Engine Shop. Go here for some great pictures of the event. Venezuela is changing its time zone to be 30 minutes earlier than it is now. (Technically, it's very early tomorrow.) It's gonna be cool, if the skies are clear. Info here: NASA Total Lunar Eclipse. In the meantime, enjoy this eclipse-and-moon-related video. Before the memories fade, I need to write down my experiences as a Giants fan watching Barry Bonds set the all-time home run record over the past month. I'm not going to spend a lot of time here writing about my feelings on the steroids controversy (summary: of course he used them, as did hundreds of others with the tacit approval of Major League Baseball, but he gets the pleasure of being witch-hunted because he's such a charming guy, and by the way, why not ask what Hank Aaron was using? ), just the fun of being a long-time Giants fan following Bonds. I've been watching Bonds march towards this record for 10 years or so, climbing past immortals on the all-time list every summer. He's slowed down plenty and the Giants, very successful for most of Bonds' time here, have hit the skids for the last few years, but he's kept on going. The record chase was in the doldrums last month when Bonds, fresh from 3 days rest, suddenly broke out and whacked 2 homers against the Cubs on July 19th. That put Bonds at 753, two short of Aaron, and the whole thing was revived. With 7 home games coming up, my son and I hit the web and bought cheap seats for all 7 games. The next week was a blur of work, Caltrain, and Giants games. Bonds played all but one game. Every time he came to bat, the ritual was the same: the batboy came out and gave the holographically marked balls to the umpire. Most of the crowd stood as Bonds stepped in. And the light show: if you saw any of Bonds' at bats during this time, you'll remember the astonishing light show as thousands of cameras flashed when each pitch was delivered. Bonds hit homer #754 on Friday that week. But that was the only one he hit all week. Fortunately, I'm a baseball fan, and the Giants chose this time to play some of their best ball of a dismal year, making the games fun no matter what Bonds did. After this homestand, the Giants were off to face their beloved rivals in Los Angeles and San Diego, Bonds one short of tying the record. In LA, the fans turned themselves inside out, booing the sight of Bonds, then booing their own team when they walked him, much to the consternation of Dodgers pitcher Derek Lowe. ESPN ran a story about the irony of artificially enhanced LA fans hollering at an artificially enhanced player. Bonds hit no homers in LA, and we acquired tickets to the next few upcoming home games. In San Diego, a local radio guy made the story all about him, announcing that he prayed in his car every day before coming to work that Bonds would not homer on his watch. Despite this divine plea, Bonds smacked #755 on Saturday, Aug. 4th, tying Aaron. "Everybody standing here at 24 Willie Mays Plaza. An armada of nautical craft gathered in McCovey Cove beyond the right field wall. Bonds one home run away from history, and he swings and there's a long one! Deep into right-center field! Way back there! It's gone! A home run! Into the center field bleachers to the left of the 421-foot marker! An extraordinary shot to the deepest part of the yard! And Barry Bonds with 756 home runs! He has hit more home runs than anyone who has ever played the game! Henry Aaron, the home run king, 755. He hit his last one 31 years ago. And now tonight in downtown San Francisco, Barry Bonds hits number 756, one more than Aaron." Of course, the place went crazy. Fireworks shot from the scoreboard and from a barge on the bay. Orange and black streamers appeared from nowhere. Banners unfurled. Bonds circled the bases. The game was stopped while Willie Mays came out and Hank Aaron spoke on the scoreboard via video. And eventually, the game resumed. All the air went out of the place, along with most of the fans. And then the circus was over. 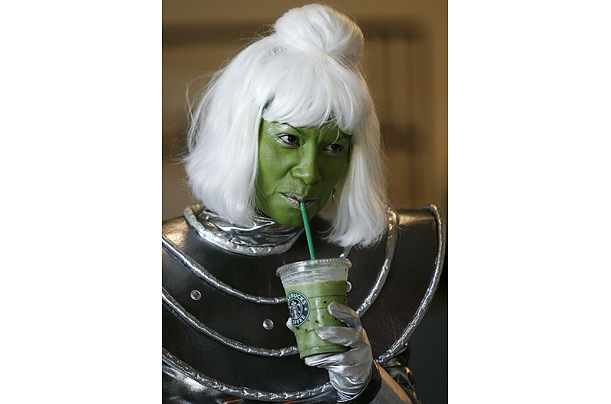 I'll start: "Soylent Green Decaf Latte is Martians!" 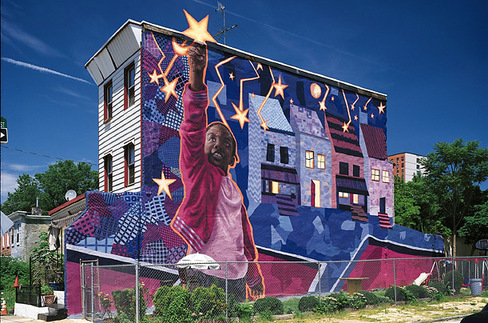 Philadelphia's Mural Arts Program evolved from a simple 1984 project organized by muralist Jane Golden to combat the city's graffiti problem.